As most of you know, I am getting married this Fall to my incredibly handsome and creative fiancé, Jason. We are having the best time planning, especially the creative aspects like designing the save the dates, invitations, and thank you cards. That's why we are so excited to share that we have partnered with PAPYRUS for all of our wedding printing needs and we will be sharing our process with you along the way -- on their global Nectar blog! At PAPYRUS, we love a good love story. As part of our Valentine’s Day series, we’d like to spread that romance with some in-real-life couples. 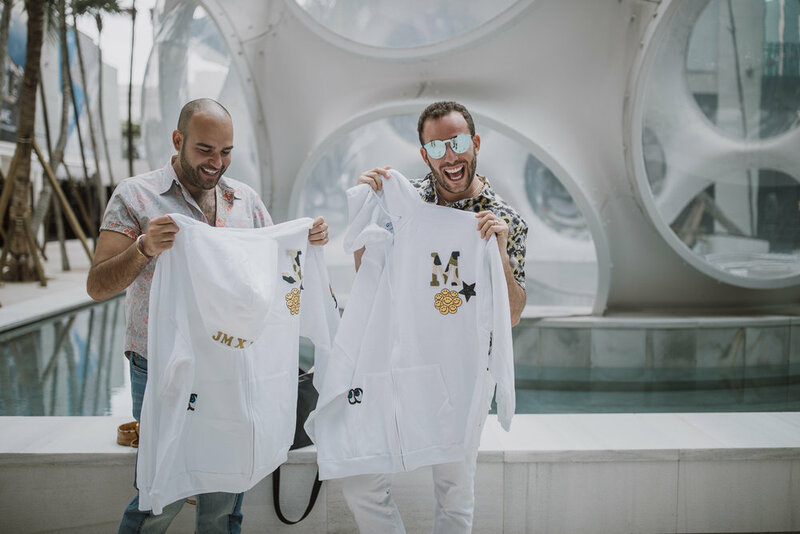 First up, Micah, a NYC-based brand spokesperson, content producer and social influencer, and his fiancée, Jason. The pair, who met in 2012—thanks to a little online dating help—will tie the knot this fall in Atlanta. They decided to make PAPYRUS part of their wedding festivities with clean, modern invitations. 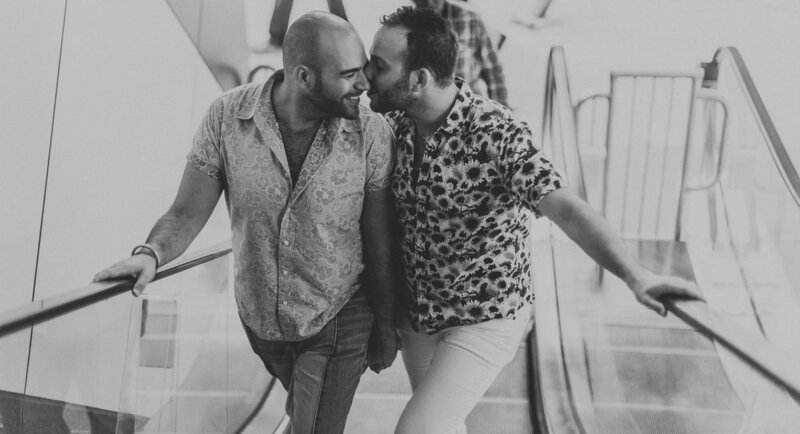 We talked to Jason and Micah about their lifestyle… and how Jason popped the big question. We met on the dating app Tinder in 2012. After chatting for several weeks, we set a first date to meet for cocktails at a charming bar called Orient Express in the West Village in NYC. What do you like best about the other person? Jason: Micah is incredibly loyal, a great friend, generous and funny. Micah: Jason is devoted, thoughtful, and so creative that it boggles my mind. Describe your perfect Valentine’s Day. We try to acknowledge our love in random ways all the time. For instance, we write each other love notes and give small gifts throughout the year. Valentine’s Day has really become an extension of that for us, and we use it as an opportunity to make reservations at a local favorite restaurant, like Frankie’s 570, or the location of our third date, Il Buco (also our favorite meal we’ve had together). When it comes to gifts, we love the mainstays of flowers and chocolates. What do you like to do on a typical afternoon? Typically, we start our days at the local Dunkin Donuts getting iced coffees. Lately, we’ve mostly been buying things for our apartment, and our current obsessions are palm trees and succulents. So we will frequent the Urban Garden Center in East Harlem. Then, we cap off the afternoon with a workout. Jason frequents SoulCycle and Bikram Yoga while Micah is a big fan of Rumble boxing. Tell us how you proposed. 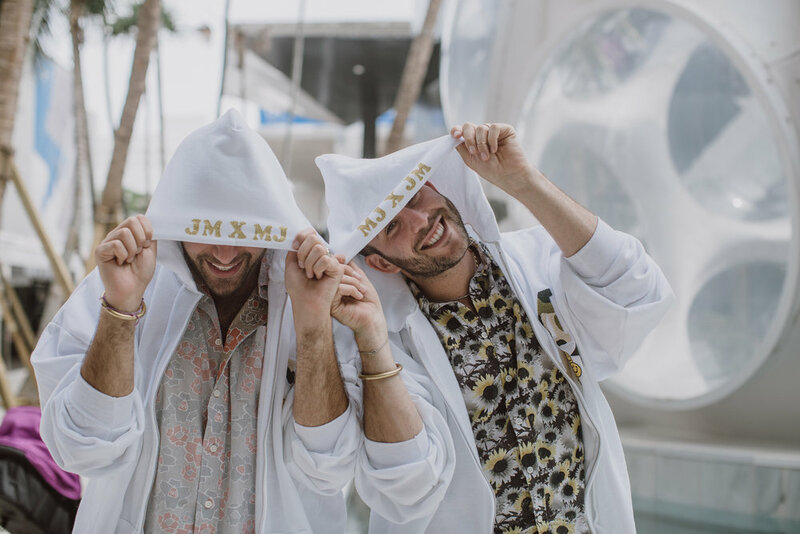 After three-plus years of dating, Jason proposed to Micah at the Palm Court in the Miami Design District while the two were visiting the sunshine state for a friend’s wedding. (Miami was the first city we visited on vacation as a couple.) Knowing how important the documentation of this occasion was to Micah, using an app called Thumbtack, Jason found two incredibly talented local photographers. There was a bit of pre-planning to make sure they could capture the exact moment, and they did. We spent the rest of the afternoon having an engagement photo shoot with them. They were a couple, so it was nice getting to share the occasion with them. Afterwards, we went back to the hotel to celebrate with friends over drinks. Why did you decide to make PAPYRUS part of your engagement and wedding? We wanted something simple, clean, and modern—but also unique—so we felt confident in the experts at PAPYRUS to turn our ideas into a reality.